Is a 15 Year Mortgage in Your Best Interest? A fifteen-year mortgage is a great bet if you’re inclined to gamble on a couple of things. The first, obviously, is that you’re betting on your ability to pay the higher mortgage rate over the long haul. If you have your own business, you have control over your employment situation. Then the question turns to whether your business or your career has the legs to be as successful for the next fifteen years as it is now. Are you in a cyclical business, affected by economic downturns? 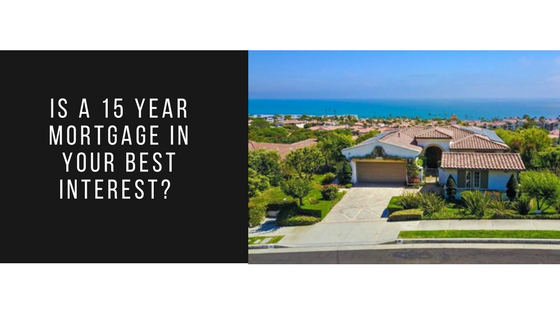 Most are, and if your fifteen-year mortgage is a stretch for you in the first place then it’s a major gamble. If you’re salaried and safe from the slings and arrows of the economy, then it’s a safer proposition. The savings in plain old dollars is substantial. One mortgage calculation tool compares the figures generated by putting a $100,000 mortgage into fifteen-year terms and thirty-year terms. The monthly payment is about $735 a month over fifteen years and about $955 a month over thirty years, with an interest rate that is a quarter of a point higher. The difference in total interest payments is a little over one hundred thousand dollars: $169,000 versus $64,000. Those are raw dollar figures, however. What is not factored in is your savings on your annual taxes engendered by the higher interest rate attached to the thirty-year note. Also not factored in are a number of intangibles. Where would that extra money go if it weren’t committed to a fifteen-year mortgage payment? Other investment opportunities, perhaps? Perhaps. But there’s a reason they call leftover money like that ìexpendable income. The reason is that most of us do expend it, rather than invest or save it. So maybe the thirty-year note means better family vacations, a few ski trips during the winter, a nicer car, without doubt, it means some added flexibility in the family budget. The value of retiring a mortgage in fifteen years is substantial, but so can be the risk. If you’re seeking middle ground, consider a mortgage that accepts accelerated payments on a spot basis. When your family income is humming along, pay a higher monthly mortgage rate and you will get a larger figure attached to your principal reduction. You will be paying the higher (30 years) interest rate with those payments, so your annual tax deduction will go up as well. You’re knocking time off the mortgage, and maintaining your maximized tax deduction. Some money managers will call the fifteen year mortgage a sucker’s bet, because if you took the monthly savings from the lower payment on a thirty year note and added it to the savings from the higher tax deduction on a thirty year note, the total in funds saved would more than offset the difference in total interest. It’s a great theory, probably has some merit, but how many of us will diligently sock away our monthly savings and yearly tax break inherent in the difference between a fifteen-year mortgage and a thirty-year mortgage? Approximately none of us. Most people look at home appreciation for their return on investment and let it go at that. Put in a financier’s terms, if a thirty-year note cuts your sleepless night quotient by a factor of twenty percent or more, it’s probably worth it. Previous: Previous post: Facing an Increase in Your Mortgage Payments?